The Fujifilm FinePix HS20 is a huge zoom power camera that promises quality snaps and easy steering, but is it worth upgrading from a HS10? When you need to pull faraway objects closer without spending a fortune on a large telephoto lens for a digital SLR, yet still require crisp image quality, the super zoom or bridge camera is the right tool for the job. The Fujifilm FinePix HS20 offers a 30x optical zoom that equates to an impressively broad focal range the equivalent of 24-720mm on an old 35mm film camera. While the longest of Fuji's long zoom category, that's not quite the biggest in its class – look to the 36x Nikon P500 – but overall we feel the Fuji is certainly one of the best. This model upgrades the year-old HS10, which we were similarly impressed with in terms of build quality, handling and feature set. While the zoom range has remained the same, the new camera raises the headline resolution from a low sounding 10.3 megapixels to a more competitive 16MP. While this jump looks good on paper, a higher resolution also introduces the possibility of more noise/grain becoming visible when shooting at higher light sensitivity (ISO) settings, so potential users will need to think about what the priority is for them. 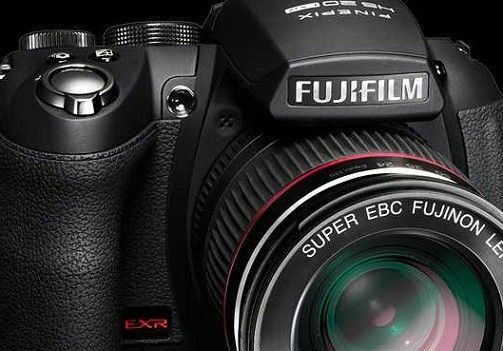 While the Fujifilm FinePix HS20 cannot be considered cheap at £350, we feel the pricing is fair in terms of how much more we're getting when compared to a top end pocket model. With large overall dimensions allowing for both chunky, user-friendly controls and a man-sized handgrip not to mention the huge zoom, the HS20 exudes quality from when first gripped even if it does feel a little heavier than its plastic-y rivals. This heft however allows for a steadier hold when using the extremities of the zoom, so sharper results handheld at maximum setting. The equivalent focal range settings are also marked on the lens barrel and visible when it's extended so you don't get lost. The on/off switch encircling the shutter release button ensures the essentials are close at hand, whilst a familiar multi directional control pad at the back and shooting mode dial up top provide the expected access to other key functions. DSLR users looking for a second or back up camera will appreciate the range of dedicated buttons for the likes of ISO and white balance. The Fuji FinePix HS20's back screen can be pulled outward from the body and tilted up or down for shot composition as well as review. This means it's as adept at achieving low angle shots when the photographer can't otherwise get an eye to the smaller electronic viewfinder (EVF) above as it is allowing for shooting at arm's length over the heads of a crowd. Being 3-inches in size and offering a clear view thanks to a 460k-dot resolution, we weren't squinting to make out what was being recorded at any stage. While it can't be folded screen inward to the body or flipped out at right angles to it, camcorder-style as with some rivals it's flexibility meant we used it with greater frequency than the EVF. The Fujifilm FinePix HS20 powers up in two seconds, which, whilst not quite a match for the latest DSLRs, means that there's time to start adjusting the LCD before you half squeeze the shutter release. Do so and the camera locks onto target instantly with a bleep of confirmation, a funky cross-hair type display presented if recording in one of the creative modes, including program, shutter priority, manual and aperture priority. A large, Fine JPEG is written to memory in around a second. The fact that the zoom here is manually controlled has another advantage. Moving from maximum wide angle to maximum zoom setting can be achieved as quick as your hand can twist the lens barrel – so in around a second or so. There's no traditional wait for an electronic lens mechanism to catch up. Action shooters also have 8fps shots to play with, and the advantage of 320fps slow motion clips, albeit at a far reduced resolution. The Fujifilm FinePix HS20 is unusual in that four standard AA batteries slot into the base of the handgrip and provide its power as well as adding to the solid feel, though these could of course be replaced with rechargeables for a longer lifespan. Nevertheless, battery life is good for around 350 shots from a fresh set of four, which is comparable with the best pocket compacts even if being shorter than your typical DSLR. With a dedicated video record button provided on the backplate rather than a movie setting on the shooting mode dial, the HS20 delivers Full HD video at a smooth and life-like 30fps, with again the ability to manually adjust framing as you go, which takes a little practice. Video shooting is supported by the advantage of stereo sound recording with microphones positioned either side of the lens at the front. The fact that the zoom is manual rather than mechanical at least ensures there's no operational buzzing and whirring to distract when capturing video. This being a Fuji, colours are to the fore, with landscape shots in which there are a variety of lush tones working particularly well. As we noted earlier we were able to achieve sharp results even when shooting at maximum zoom/telephoto setting, which means the camera's main selling point is one that is actually worth buying into. Whilst in truth the sharpness of the Fuji's shots are not quite a match for an actual DSLR with some quality glass, achieving the breadth of the focal range here would be both physically impractical and financially impossible for many DSLR owners to match. On the Fujifilm FinePix HS20 the zoom lens is all, and if you don't need the whopper it offers, more manageable alternatives can be found. However we feel the HS20 is one of – if not the current best – in its class, and will suit any amateur looking for an all rounder that's a solid choice in just about every way conceivable.